Scott Pruitt has resigned as administrator of the Environmental Protection Agency after a deluge of damaging revelations about his spending, travel and a condo rental that prompted Republican lawmakers to distance themselves and question his continued effectiveness. President Donald Trump announced in a tweet on Thursday that he had accepted the resignation. “Within the Agency Scott has done an outstanding job and I will always be thankful to him for this,” Trump said. 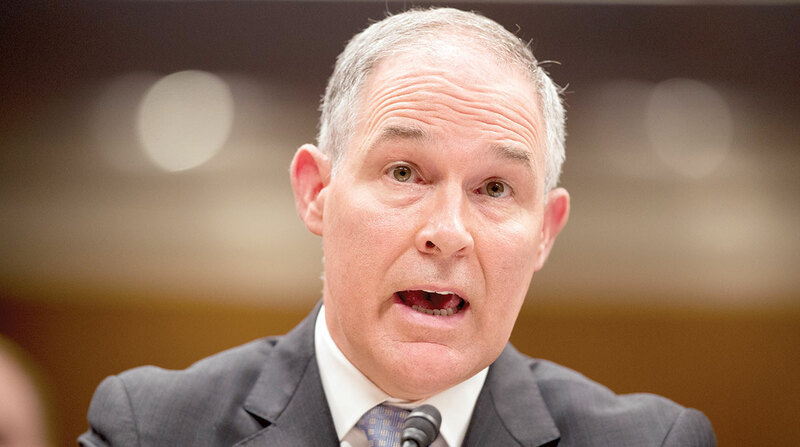 It is a dramatic turn of fortune for Pruitt, who was celebrated by conservatives for zealously attacking the EPA as Oklahoma’s attorney general. Once he got to Washington, he acquired a national profile for methodically moving to dismantle Obama administration regulations on climate change and air pollution. A former coal lobbyist, Andrew Wheeler, will take over the agency as acting administrator on Monday, Trump said. Wheeler was confirmed as the EPA’s No. 2 official in April. Unlike Pruitt, Wheeler has a low-key approach, cultivated during years working in Washington — including a previous turn at the EPA and time on Capitol Hill serving under Sen. James Inhofe, an Oklahoma Republican. Pruitt’s departure is a victory for environmentalists and good government advocates who have campaigned against the EPA administrator’s conduct since his confirmation in February 2017. They cast him as an unabashed ally of corporate polluters and assailed what they called his ethical abuses. At least 170 Democrats and four Republicans in the House and Senate had sought Pruitt’s ouster amid allegations of ethical missteps and abuses of power, including his decision to rent a bedroom in a Capitol Hill condominium from a lobbyist for $50 a night under unusually generous terms. Pruitt, 50, also drew fire — and at least a dozen formal investigations — for frequent travel to his home state of Oklahoma, questionable spending decisions at the EPA, raises for two top aides and accusations some employees were sidelined after challenging the administrator’s decisions. Recent disclosures also revealed the extent to which Pruitt enlisted aides to conduct an array of personal errands, including helping him find housing in Washington, buying a second-hand mattress from the Trump International Hotel and pursuing a Chick-fil-A Inc. franchise for his wife. At least some of the work was conducted with EPA email and during working hours, potentially violating federal ethics rules that bar federal employees from using their public office for private gain and soliciting gifts from employees. At least five political appointees, including three longtime Pruitt allies, left the agency as allegations mounted. But the animosity Pruitt generated among liberal activists is matched by the fondness he inspired on the political right. For more than a year, that helped insulate him and gave him leverage within the White House — power he successfully used to help persuade Trump to pull the U.S. from the Paris climate agreement. Trump stood by Pruitt for months. He defended his EPA chief in an April 7 tweet proclaiming that “Pruitt is doing a great job." The president reiterated his confidence in the administrator on May 11 and again on June 6, saying the “EPA is doing really, really well” under Pruitt’s leadership. But by June 15, the president’s support had softened, with Trump saying he was “not happy” about some of Pruitt’s actions. Some Republican lawmakers and business lobbyists questioned whether the steady stream of revelations was undermining Pruitt’s day-to-day work on intricate environmental policy and limiting his room to maneuver on sensitive issues. Republican lawmakers on both sides of a contentious debate over the U.S. biofuel mandate seized on Pruitt’s problems as leverage to try and influence EPA policy decisions in June. And prominent conservatives pushed for Pruitt’s ouster, including commentator Laura Ingraham and the National Review, which said the administrator should be replaced amid reports of questionable behavior. Pruitt defended himself against some of the allegations in congressional hearings in late April and early May, calling them “a distraction” promoted by critics who “want to attack and derail the president’s agenda.” After telling lawmakers that EPA career staff oversaw the acquisition of a $43,000 soundproof phone booth, Pruitt issued a memo putting three political appointees in charge of approving any expenditures of more than $5,000 on his behalf. Congressional lawmakers also have been scrutinizing Pruitt’s reliance on first- and business-class airplane flights, a practice EPA officials have defended as necessary amid vulgar, aggressive encounters and escalating threats. In April, the Government Accountability Office concluded the EPA violated federal spending laws by failing to give Congress advance notification of the secure phone booth purchase. Pruitt has been the one of the most enthusiastic crusaders in Trump’s campaign against regulations that the president said were throttling U.S. jobs. He has been the face of the Trump administration’s efforts to reduce regulatory burdens on businesses, shrink the federal government’s footprint and jettison Obama-era policies against climate change. At the EPA, Pruitt began rewriting a host of rules, including a measure that critics said gave the federal government too much power to regulate waterways nationwide and the Clean Power Plan, former President Barack Obama’s signature plan for combating carbon dioxide emissions from electricity. He also has led the rewrite of EPA policies to limit what scientific studies can be used to justify agency regulations, curb settlements with conservationists and relax a decades-old air pollution policy. Under Pruitt’s watch, the EPA also has decided to revise vehicle standards and delayed a rule to boost the safety of chemical facilities. Pruitt said he was reorienting the agency toward its core mission, ensuring states played a significant role in environmental oversight and spurring the cleanup of toxic Superfund sites.